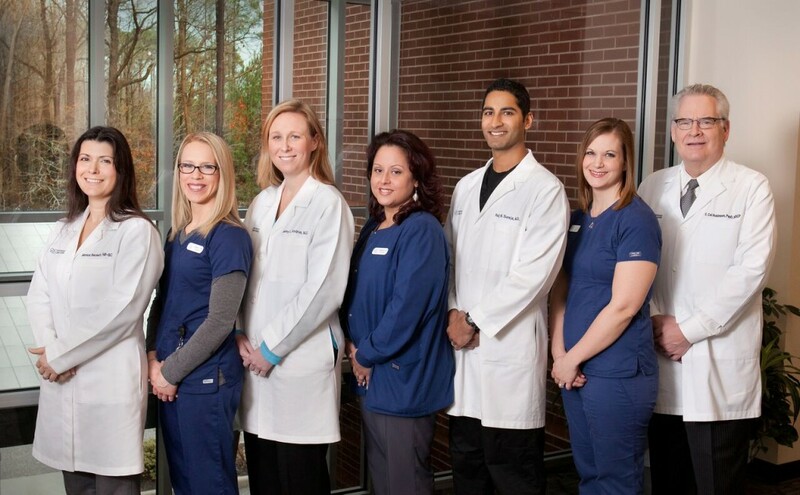 Meet the Interventional Pain Management team at Orthopaedic & Spine Center (OSC)! These individuals are devoted to the identification and treatment of chronic pain disorders. They interpret the patient’s pain in the context of their clinical history, physical examination and diagnostic imaging. We now offer Medical Psychology services for our patients, as an adjunct therapy for treating the depression, anxiety, catastrophizing and other cognitive disorders which often accompany and exacerbate chronic pain conditions. In doing so, OSC has created the most comprehensive, holistic program for treating chronic pain in the area. Pain management is an important part of a patient’s treatment and recovery from orthopaedic and neurological disorders or injuries. Pain can cause sleeplessness, depression and limitations on the ability to move — all of which can slow down recovery. It is important to manage pain before it becomes too intense or chronic. We use various minimally-invasive techniques specifically designed to diagnose and treat the underlying causes of painful conditions. These interventional treatments have been safely performed for many years. Occasionally, medications are necessary for the initial treatment of pain, but we try to avoid the use of narcotic pain medicine if possible. Physical therapy is often a very important aspect of treatment for the purpose of reducing pain, restoring function, and educating patients on how to avoid recurrence of their problems. In the beginning of treatment, pain is usually treated with conservative measures, including Cognitive Behavioral Therapy. If these don’t work, we will then try stronger approaches. As pain management physicians, we are ideally suited to help patients with chronic pain problems. Our pain management center offers a full range of diagnostic testing, as well as many treatment plans that are non-surgical in nature. These include spinal injections such as epidural and facet joint injection as well as spinal cord stimulators and radiofrequency ablation. We also offer Acceptance and Commitment Therapy, Mindfulness and Relaxation training, Coping Skills training and Family Education through our Medical Psychologist. Fluoroscopy is an imaging technique that uses X-ray to see real-time images of the skeletal system. The use of fluoroscopy helps guide the physician to precisely inject medications into the area causing the patient’s pain. There are a variety of treatments that we use to treat a wide range of diagnoses. Fluoroscopy affords us a more effective method of treatment for chronic pain, because of the precision and enhanced safety it affords. We have 2 fluoroscopy suites in our office, where we perform all interventional procedures. Do you need an Interventional Pain Management Specialist? What can you expect on your first visit to an Interventional Pain Management Specialist? The Pain Management Center at OSC is located on the second floor of our practice. It features separate waiting rooms for patients who come in for medical procedures and for office visits. We have 8 exam rooms and 2 state-of-the-art procedure suites. To schedule an appointment with our pain management doctors, call Orthopaedic & Spine Center at (757) 596-1900. Visit our Contact Us page for information on our location and office hours.